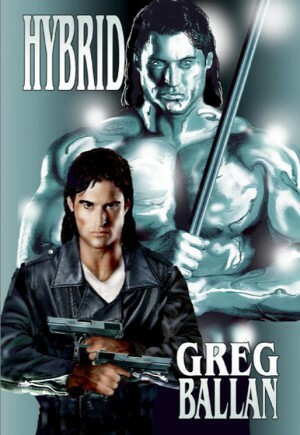 Hybrid: A science fiction thriller with a good dose of scary! Erik Knight, a small time private investigator, always knew he was different from everybody else. Keener senses, heightened awareness and an enhanced physical strength that could be called upon by his sheer will. Erik becomes involved with a team of high profile investigators and local police trying to locate a girl who was kidnapped in the middle of a playground amongst dozens of adults and children. None of the adults saw anything and what the children claim to have seen is too far fetched to be believed. The search evolves into a full-scale manhunt into the dark and desolate woodlands of the Hopedale Mountain. After a lethal encounter and a fatality, Erik, the investigators and police realize that what they’re dealing with isn’t a man and possibly isn’t of this world. What they’re dealing with is a sentient evil that has an appetite for young children. Erik looked throughout the park grounds, focusing his vision, but he couldn’t see anything. Fifty yards away, the children played unaware of anything but their innocent fun. Erik walked quickly over to where the party was, Shanda following close behind him. As he closed the distance he noticed that his daughter was staring at something and pointing. Erik looked in the direction she was pointing and saw a patch of darkness. His mind shrieked with panic and he ran toward his daughter, screaming for the other girls to leave the park area. The girls looked at the direction Brianna was pointing at and froze. They were terrified, frozen into inaction. After a quick sprint, Erik was beside his daughter. Several of the other mothers had gone to their children as they all pointed out the closing patch of darkness. Mothers and children were panicking. Children were crying with fright as the afternoon sun seemed to dim and the temperature in the park suddenly dropped twenty degrees. Brianna hadn’t moved since Erik came by her side. “What do you see, honey?” he whispered. Brianna’s eyes were transfixed on the corner of the park. Her finger still pointed in that direction. “It’s a tall man, I think. I can tell that it wants me. It’s calling to me, Daddy. I’m scared. Please don’t let it take me. I can tell it wants to take me.” She screamed in mindless terror. Erik reached behind his back and pulled his Ruger from its place of concealment. He wrapped both arms protectively around his daughter, his gun pointing in the direction of her finger. She gently guided his hands so that the pistol was aiming at the heart of the dark anomaly. “Go back with Shanda and the others, now!” he told her. From behind them, the ponies were shrieking in panic. “All right, you two, get back!” Erik stood up. He holstered his weapon and began walking toward the darkness. “I know you’re there!” Erik called out to the inky darkness. “Maybe you can hide from them, but you can’t hide from me!” Erik focused his eyes; concentrating his extra senses on the darkness as he continued forward. Slowly he saw the man-like figure materialize. The figure had stopped its approach and assumed an aggressive stance. Erik paused a scant twenty feet from it and assumed a basic combat stance he used in Kung Fu. The thing responded with silence. Erik finally saw the blood-red eyes looking right through him. He could feel the hatred, the sheer malevolence; yet, now he also felt desperation, a hunger that was beyond his ability to define. The hostility threatened to overwhelm him. Erik fought his own emotions, fought down his own fear and doubt. He knew he couldn’t defeat this thing physically, but he would not let it have his daughter or any other child there, not while he drew breath. Like what you’ve read? You can get Hybrid right here. To read some of Greg’s musings visit his writing page on facebook, for several short stories and pithy takes on yard work and homelife. Like our Lachesis Publishing page on facebook.